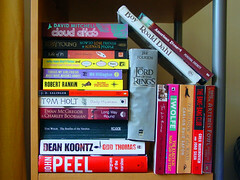 I read blogs – a lot of them. Some are for me because they’re in areas that interest me – such as Geekosystem and Singularity Hub, industry blogs so I can know when FB changes the proper picture size from 404×404 to 406×406 and can spend hours assigning someone to rewrite our best practices memo on the topic – Mashable, All Facebook, and Brafton. I read some just for fun – like TastefullyOffensive (for what should be obvious reasons). I don’t read as many as my colleague Robert Checkal who helps curate content for some of our clients – his Google Reader is by itself is an occasional S__storm of great content. I read every single blog post and comment PRBC has ever published. Not only because I respect our writers enough to do that, but it’s my “job” and if anything slips by that shouldn’t it’s ultimately on my shoulders. I read books (and wish I had more time to read more of them). Proper science fiction (or as purists would say – speculative fiction) is a favorite from the likes of Heinlein and Clarke. I read them since they aren’t real – they’re better than real – they show us what can be, not what is. Biographies, such as the Heinlein biography I just finished part one of, and The Gun by NY Times Sr. Writer C.J. Chivers which, while probably technically a “History” book is essentially a deserving biography of the AK-47 with a background on automatic firearms generally and possibly the best book I’ve read on how technology, world affairs, and proper timing (i.e. luck) play in the development and advancement of technology. A proper review is coming one of these days. It was also the holiday gift from my firm this past year. Biographies (if done properly) show us the other side of things we thought we knew about and make the person human, subject to human foibles and fallacies. Anything on the proper examination of human behavior – Dan Ariely’s Predictably Irrational is a recent favorite. Humans are humans and if, as marketers, we don’t think a bit deeper into what drives people we’re sorely missing the mark. Philosophical books disguised as novels – Zen and the Art of Motorcycle Maintenance and The Stranger have been favorites since high school. I read dystopian novels such as 1984 and Blindness since they show us how things can go horribly, horribly wrong. I read Esquire – it reminds me that long form journalism isn’t dead, introduces me to new books with extensive and appropriately edited excerpts (I found The Gun through one of their excerpts) and I can find tips and instruction on everything from how to properly (and with the littlest of effort) stock a liquor cabinet (handy following a move where it’s just not worthwhile to move the booze), to financial information. The editors also slice and dice chefs, athletes, politicians, actors and artists with the same blade and show their inner fire that drives them. The editors also have great content frameworks I may have used as inspiration in my work. I read the articles friends who know me send me, and skim the ones who don’t know me that well send me. What are you reading dear reader?